Fairfax County Archives - Read. Think. Act. 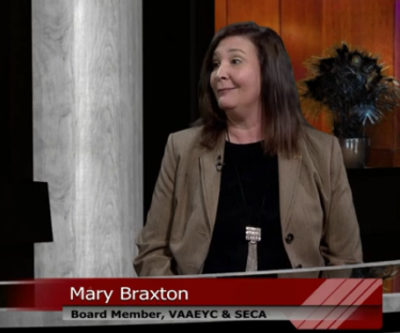 (February 27, 2019) Catherine Read sits down with Mary Braxton, Board member of the Virginia Association for the Education of Young Children (VAAEYC), to discuss early childhood education in the state of Virginia. Braxton has had a long career in early childhood education. She was an owner/operator of her own in-home childcare business for 27 years, and is a long-time board member of the VAAEYC. Additionally, Braxton also serves on the Southern Early Childhood Association (SECA) Board, as well as being a former President of the Virginia Alliance of Family Childcare Associations. Her breadth and depth of knowledge surrounding early childhood education is wide and deep. Braxton has stood as a strong advocate for Virginia’s children by promoting policies that help improve access to quality early childhood education options. The VAAEYC has its roots in the Virginia Council on Social Work. Efforts began in 1955 to bring together child care personnel and others interested in preschool children. In 1956, sixty individuals attended a Child Care Preschool Institute in Roanoke, VA. A year later, 200 advocates met, adopted a constitution, and selected the name – the Virginia Association for the Education of Young Children. In 1969 the state association decided to affiliate with the national organization (NAYEC), and then in 1972 the group also affiliated with the Southern Early Childhood Association (SECA). The mission of the VAAEYC is to promote the professional growth of persons working with young children, improve the availability and quality of developmental and educational services and resources for young children, to advocate and promote public policy decisions which improve the quality of life for young children and their families, and to support, disseminate and utilize research related the well being and education of young children. The organization focuses on children ages birth to eight years of age, and there are eight chapters of the VAAEYC located throughout the commonwealth. Braxton speaks passionately about the importance of quality pre-K education as the foundation of learning for children. Preschool is where children learn the social and emotional skills that they need for success in both school and in life. Studies have shown that children who have access to quality preschool education have better outcomes than their peers who do not. Braxton and her colleagues work tirelessly to help advance the cause of making affordable childcare accessible to all children. She notes that over 1/3 of the state of Virginia is considered a “childcare desert”, meaning that there are not enough programs to meet the needs of all children who want to access preschool education. Former Governor Terry McAuliffe established the first ever Children’s Cabinet in Virginia to spotlight the importance of early childhood education. This group has continued under current Governor Ralph Northam, and has expanded to include the first School Readiness Officer in Virginia, Jenna Conway. Her role is to help expand access to quality pre-K education to all Virginia children. Access and quality of childcare varies widely from jurisdiction to jurisdiction throughout Virginia. In Northern Virginia, there are strict licensing requirements for child care providers in Fairfax, Arlington and Alexandria. This assures parents that their children are in a safe environment, weather they are at a daycare center or with an in-home daycare provider. These include things like background checks, CPR certifications and property assessments to ensure a safe environment. In Prince William County, however, providers can have up to 4 children in their home without being subject to any licensing requirements whatsoever. The many statewide organizations are working together to help bring about positive policy change in regards to early childhood education. They are in regular contact with local, state and federal representatives, and often speak and testify at public hearings in order to advance their issues. As the critical importance of quality early childhood development is more widely accepted as an integral factor in future wellbeing, Braxton is optimistic that their agenda will be more widely accepted, and she encourages everyone to visit their website to better understand the policy initiatives that they are advancing. The VAAEYC is holding the 63rd annual conference, entitled Constructing Solid Foundations for Children, on March 14-16 at the Hotel Roanoke in Roanoke, VA. The conference is the premier professional development event in Virginia for early childhood educators. The conference will feature 100+ workshops, catering to all aspects of preschool education. Braxton is excited to bring together childcare professionals from around the state to share ideas and best practices. One of the things she loves most about these conferences is that childcare providers are treated as true professionals. Braxton shares that the energy at the conference is palpable, and the attendees find it both empowering and motivating when networking with others in their field. Those interested can visit the website to learn more and sign up for the conference. 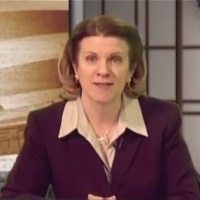 (February 20, 2019) Catherine Read interviews Kelly Henderson and Dee Robinson-Rutkowski of Formed Families Forward (FFF). Their organization is dedicated to supporting foster, kinship and adoptive families of children and youth with disabilities and special needs. They serve families, educators and child welfare professionals in the Northern Virginia area. Formed Families Forward is a non-profit supported through a federal grant, established to assist adoptive and foster families navigate the complicated world of acquiring services to support children with special needs. Studies show that youth in foster and kinship care are at a higher risk of having disabilities, and therefore requiring special education services. In addition to medical needs, many of these children have suffered emotional trauma from being in an unstable environment, and need extra support to recover and become healthy and whole. Dee came to Formed Families Forward after she and her husband adopted their two sons through the foster care system. They faced many challenges and had some very rocky years, especially during middle school. She became connected to FFF after meeting Kelly through her Middle School PTA. Dee is thankful to have had someone to help her navigate the system so that they could access the much needed resources to help her sons. It helped to ease their burden, and put her boys and their family on a path to wellness. In addition to connecting families with the resources that they need, FFF also runs support groups for both students and parents. These groups are very important because families can connect with one another, and understand that they are not alone. FFF also conducts one on one consultations, so individual families can make sure that they understand how to find the support and resources that they need for their children, and get what their children need to thrive at school and at home. As the organization evolves, Kelly and Dee note that they are working on different initiatives to meet their clients’ needs. They are just finishing up the production of a webinar focused on Fetal Alcohol Syndrome, and the impacts and effects that this has on children as they age. They also have programming focused on ADD and ADHD, which is one of the most common diagnoses that children in foster and adoptive care face. In addition to helping families understand how to establish classroom accommodations, there are many things that parents can do with children at home to help manage symptoms. In addition, there is a growing movement recognizing how trauma can affect children, and have an impact on their ability to learn and fully participate in the classroom. Trauma Informed Community Networks are being established in Fairfax County for the first time. These networks are designed to help educators and service providers better understand the obstacles and challenges faced by students who have suffered from traumatic events at a young age, and help coordinate efforts in supporting these children. (Oct. 15, 2018) Catherine Read interviews State Senator Scott Surovell (D-36), in a discussion ranging from transportation to predatory lending to environmental reforms regarding coal ash. Sen. Surovell represents the 36th district, including parts of southeastern Fairfax, eastern Prince William and northern Stafford counties. Surovell is a native Virginian and graduate of West Potomac High School, James Madison University, and University of Virginia Law School. He is proud to represent the area in which he grew up. Throughout his tenure in the Virginia General Assembly, Surovell has worked hard to expand opportunities and help solve problems for his constituents. He was first elected to office as a Delegate in 2009, followed by a successful bid for the state Senate in 2015. He recognizes the great disparity and income inequality in his district, which very much mirrors what is happening throughout Northern Virginia. 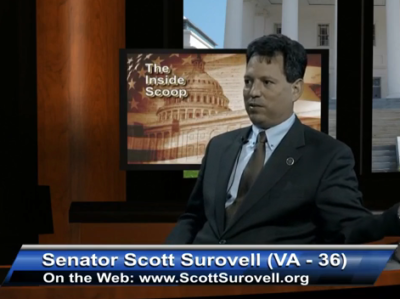 One of the areas that Sen. Surovell has paid particular attention to is the Rt. 1 Corridor, stretching through the Alexandria portion of Fairfax County. Year ago, this corridor used to be a vibrant commercial district, but has been left behind as much of the rest of the area experienced economic growth. The result is that these neighborhoods are now some of the poorest and are home to some of the most vulnerable residents of Fairfax County. Starting in 2009, Surovell brought his big ideas to VDOT regarding redevelopment along the corridor. He successfully lobbied VDOT to fund a study of the area south of the Huntington Metro. This led to a set of recommendations that were given in 2015 to ultimately widen Rt. 1 to 6 lanes and to institute a Bus Rapid Transit (BRT) system to facilitate traffic flow. Accordingly, the land needs to be rezoned along the corridor to allow for increased density. In order for the region to qualify for grants through the Federal Transportation Administration, the number of residents needs to increase from 40,000 to 100,000 in order to support the investment in transportation upgrades. One of the biggest concerns that surround a redevelopment project of this scope is to ensure that residents are not displaced during the construction of the project. There is already a shortage of affordable housing in the area, and when planning the redevelopment it will be crucial to ensure that affordable housing remains available. In order to qualify for the federal funding, there is a provision that there is no net loss of affordable housing after the project is complete. Additionally, public officials need to be very careful that communities are not displaced and torn apart. As part of the Northern Virginia Transportation Authority (NVTA) Act that passed in 2013, which raised the gas tax and grantors tax in order to fund local transportation initiatives, the Rt. 1 corridor is finally seeing some money flowing down to fund projects. The NVTA is making a $370 million down payment to begin the work on this development. The process of getting this work done is long and complex; Surovell said we can expect to see a shovel in the ground in 2026. Additional projects in his district include widening of Rt. 1 in Dumfries and the bottleneck of traffic on I-95 South when crossing the Occoquan. The hangup with that particular project includes having to renegotiate the contract with Transurban, who maintains the HOT lanes on I-95, as they will suffer in lost toll revenue if the road is being worked on. Sen. Surovell has worked hard over many years to bring reform to the power industry in regards to how they dispose of coal ash. Coal ash is the residue that is produced after burning coal for power. For years, standard operating procedure allowed Dominion Energy, the state’s main power provider, to bury this coal ash in the ground. Holes were dug, filled with water and the ash was dumped in them. Several years ago those coal ash “ponds” burst, and that coal ash flowed into the adjacent rivers, polluting the Potomac, Occoquan and James Rivers. The EPA then ordered the state to shut down the practice and clean up the sites, which all show evidence of arsenic, cadmium, lead and hexavelant chronium, mercury and selenium. Up to this point, Virginia was the only state that did not require power companies to recycle coal ash. The good news about this is that the coal ash that is being dumped is a key ingredient in the production of concrete. So much so, that the concrete companies are actually importing coal ash from Italy in order to meet their supply needs. Dominion will eventually be able to sell this as a product to the local concrete companies. The ash that needs to be cleaned up could also be marketable, however the challenge is that the coal ash that the ash will need to be dried out and the problem chemicals will need to be extracted from the ash before it can be sold. The question faced today by lawmakers is how much will this process cost, and how much can Dominion will be allowed to hike rates to cover their costs. There are currently a small group of delegates and senators who are working on coming to a consensus on how to best handle this multi-billion dollar issue. Another very prevalent issue in Sen. Surovell’s district is the practice of predatory lending. There is a high concentration of predatory lenders located in the Route 1 Corridor, including a variety of Pay Day and Car Title loan companies. Over the past several years there have been numerous restrictions on these practices, and it seems like each time there are rules put in place to curb the practice, new companies pop up in a different iteration with another way to scam borrowers. In 2009 the state put a 36% rate cap on payday loans. Then, in 2010 the car title companies showed up to offer an alternative to those in need. In 2011, the laws put in place were not well constructed, which opened up the door for these companies to lend to car title holders in MD and DC (where this practice is greatly restricted) for up to 267% APR. The people who are seeking these loans are desperate and often do not understand the implications of what they are doing. They often borrow to pay off other loans, and the situation can tend to snowball for them. If you have feedback for Sen. Surovell he is open to hearing from constituents, and would like to work with his colleagues to curb these practices. 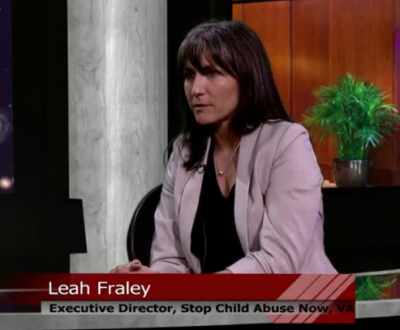 (Oct. 10, 2018) Catherine Read interviews Leah Fraley, Executive Director of Stop Child Abuse Now (SCAN). SCAN works to ensure that every child in Northern Virginia grows up in a safe, stable, nurturing family, with the supports that they need to contribute to stronger communities today, and as adults in the future. Their mission is to promote the well-being of children, improve parent-child relations and prevent child abuse and neglect. Since 1988, SCAN has worked hard to accomplish their mission through three primary activities. The first is to educate the public about the scope, nature and consequences of child abuse and neglect, and the importance of positive, nurturing parenting. The second is to provide direct parent education opportunities, and the third is to advocate for the children in the community, the legislature and the courts. This effort requires them to collaborate with many community partners; and SCAN always aims to meet parents where they are in the community so that programming is accessible to all who need it. For example SCAN’s parenting education classes are offered at a variety of locations throughout the region. SCAN will provide either childcare for children under the age of four, or will offer parallel programming for school aged children, designed to help them build strong relationships with their parents and siblings. These classes are aimed at improving family communication and help parents and children both develop skills to deal with challenges and stressors that can lead to abusive behaviors. SCAN builds strong relationships with those in the public sector, including schools, the court system and the local government agencies, to deliver their services to those in need. They aim to be a resource to anyone who thinks that there is a child in trouble, and is happy to offer guidance and best practices to those who need help in getting families the needed supports. Fraley points out that our region is unique in that we have a very multi-cultural region. There are families who come here from many different places, and bring their own way of life with them. This requires flexibility and understanding that there is more than one way to do things. She stresses that the programs that they offer give people of all cultures an opportunity to improve their family relationships in both small and large ways. Recently, they have worked with refugee families who are being reunified after spending much time apart. Some parents have not seen their children in years, and need to get to first get to know their child again. They may have been good at parenting a 10 year old, but if has been years since they were together and the child is now a teenager, the parents will have different challenges ahead of them. Additionally, the child might be upset that the parent left them behind. SCAN aims at helping these families navigate this difficult process and learn to function in their new environment. Fraley notes that SCAN is an organization that is run primarily by volunteers, who do everything from run classes, work with Court Appointed Special Advocacy Programs, provide childcare and transportation, and advocate on the local and state level for changes to improve our system. On November 3rd SCAN is holding its annual Toast to Hope event in Springfield to bring the community of volunteers and donors together to raise money for the cause. More information can be found on the website if you are interested in supporting SCAN or becoming a volunteer. 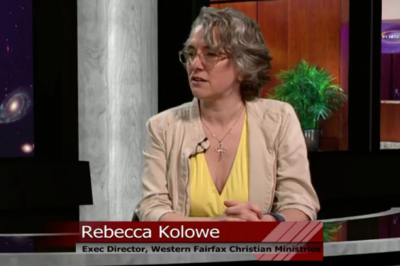 (Sept. 19, 2018) Catherine Read interviews Rebecca Kolowe, Executive Director of Western Fairfax Christian Ministries (WFCM). WFCM provides compassionate, life essential services to reduce hunger and the risk of homelessness amongst vulnerable residents of Western Fairfax County. WFCM serves individuals and families of all ages, religions and nationalities from the communities of Chantilly, Centerville, Clifton, Fairfax Station and Fair Oaks. Thirty-one years ago, 12 local churches came together to found WFCM. Today, the organization has the participation of over 40 local communities of faith, including mosques and synagogues. The food pantry is the primary focus, although they do also offer assistance with utility shut-off and eviction notices. Kolowe notes that they will never turn anyone away, and all who walk through their doors will be served a meal. Most of their clients come to them through referrals from the County, and most return on a monthly basis to stock up on essentials. Hunger knows no bounds, and WFCM serves those of all age groups. Kolowe points out that 15% of the people frequenting WFCM are seniors. Recently, there were two large fires in the community, which displaced many residents. The senior home that caught on fire destroyed 88 units, and WFCM helped to support the displaced residents. They worked hand in hand with other organizations within the community to help replace items such as medication, dentures and medical equipment. On October 12th WFCM will hold its 11th annual gala dinner in order to raise funds to support their very important work. Ken Harvey, former linebacker from the Washington Redskins, will be the keynote speaker and Tracie Potts of NBC News will be the Mistress of Ceremonies. Kolowe is excited about the event, and hopes to grow attendance in order to raise money for the organization. If you would like to join them, or become a sponsor, tickets are available on their website. One of the largest obstacles that many of her clients face is traveling to the pantry, since many of her clients do not have their own cars. It can sometimes take an entire afternoon of bus travel to make a 5-mile trip to the pantry. Kolowe would love to think outside the box, and work with their partners in the community to help solve these problems. For example, she could envision volunteers who are able to transport clients from their places of worship to and from the pantry, to ease the burden on her clients. There are many possibilities when everyone comes together to help tackle these obstacles, and Kolowe is open to exploring all of the possibilities. 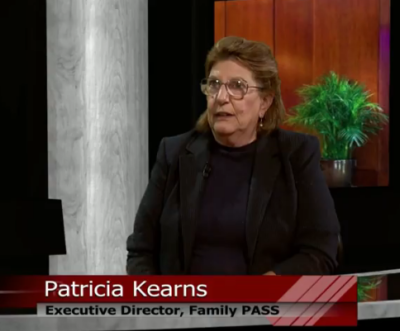 (Aug. 29, 2018) Catherine Read interviews Patricia Kearns, Executive Director of Family PASS (Preservation And Strengthening Services). The mission of Family PASS is to help families who are homeless, or are at risk of homelessness, in Fairfax County connect with the support services that they need to become self-sufficient. The work of Family PASS is an integral part of Fairfax County’s 10-year plan to prevent and end homelessness in the community. Family PASS was founded in 2006 and has served 120 families, including over 250 children since inception. Kearns shares that 33% of the homeless population in Fairfax County is under the age of 18. Keeping families in their homes is among some of the most important aspects of the work that Family PASS does, as this ensures stability in education for the children. They provide access to emergency funding in order to reduce the rate of evictions, and provide the needed wrap-around social services to address issues that are at the root of the problem. This includes education, job training, medical and dental care, transportation assistance and help with childcare. These services are designed to help people get employed, or stay employed, so that they can afford to support themselves. Kearns explains how the system works for a person or family who is at risk of homelessness in Fairfax County. The Coordinated Services planning office will assess the needs of a family, and then refer them to a partner organization that can help. When a family is identified as needing emergency assistance in order to remain in their home, they are directed to Family PASS. Family PASS also receive referrals from organizations like Northern Virginia Family Services, who embrace the “housing first” philosophy. After a family gets settled with housing, they might be referred to Family Pass for additional support services, so that they can acquire the skills that they need to remain in their home. For example, they may need help with financial literacy skills so they understand how to budget the money that they do have in order to ensure that they do not lose their home. Although Kearns notes that there are 987 homeless individuals who are identified in Fairfax County today (a reduction in half of what it was in 2008), there are still many more people living on the edge who are at extreme risk of losing their homes. Approximately 20,000 people fall into this category, while another 63,000 people are living at or just below the poverty line. These are the working poor, those who make minimum wage in low skill service jobs. Many of these people are in shared housing arrangements because of the lack of affordable housing here in Fairfax County. She also points out that the minimum wage of $7.25/hour, is not a living wage. These individuals cannot support themselves, let alone a family, on this meager income. This situation leads to people trying to hold down multiple jobs in order to make ends meet. Kearns encourages all who are watching to bring up the issue of affordable housing and a living wage to their local elected officials. People can appeal to their local supervisors, town councils and state legislators to urge them to support these important initiatives. (May 2, 2018) Catherine Read interviews Beth Tudan, Executive Director of the League of Women Voters of Fairfax. Their discussion focuses on the League’s voter registration campaign for high school students, prior to the June 12th Primary and the November general elections. The League of Women Voters is a non-partisan organization, founded during the suffragist movement, that encourages informed and active participation in government, works to increase understanding of major public policy issue, and influences public policy through education and advocacy. The League of Women Voters has recently renewed and revamped their efforts to bolster voter registration amongst high school students. After Beth’s own son went through his senior year of high school she saw first hand that there was no standard of how schools were handling the process of helping students to register. Some were registering during government class, but not all students were taking government. Some classes had the Board of Elections come in to talk about voting, some did not. Even within the same school, this process varied widely based on what classes the students were enrolled in. As one of only three organizations who are authorized to go into the schools (the other two being the Board of Elections and Inspire Virginia), Beth recognized an opportunity. She took time to look around at best practices, and bring a better solution to the table. After working with the neighboring League in Arlington, and gathering information from successful programs across the country, she came up with a script and program that can be easily replicated in the classroom throughout Fairfax County. Beth sees this as an opportunity to partner with the schools in order to make a big impact with the 12,000 seniors registered in FCPS high schools countywide. 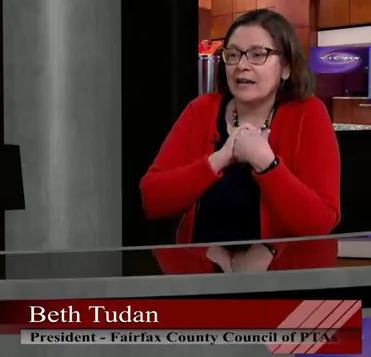 In collaboration with the Fairfax County Council of PTA’s (FCCPTA), where Beth also serves as President, she suggested running a countywide competition to see how many students each school could register to vote prior to the June primaries. This contest promotes school spirit and gets students to encourage their friends to take action. The League has visited many of the 27 high schools in FCPS. They have done presentations in government class, as well as host information tables with registration information in the school cafeterias.To date, 3500 students are registered out of a total of approximately 12,000 students. Even though not all students are US citizens or VA citizens, it is evident that there is more work to be done. Tudan shares that students do not have to be 18 in order to register, but they do need to turn 18 by Election Day, November 6th. They simply need to submit their contact information, be a US and VA citizen, and provide their social security number (which can be found on the Common Application for college). The form can be submitted on paper or online. In fact, if the student has a driver’s license then have already been verified, therefore the online form takes a mere 5 minutes to complete and submit. The deadline to register to vote in the June 12th primaries is May 21st at 5pm (11:59pm for online forms). The deadline to register for the November 6th General Elections is October 15th at 5pm (11:59pm for online forms). Remember, you can register as long as you will be turning 18 by November 6th. (Apr. 4 2018) Catherine Read interviews Joe Fay, Executive Director of FACETS, a local nonprofit that touches and improves the lives of thousands of families every year. Founded in 1988 by Linda Wimpey it was orginally known as Fairfax Area Christian Emergency & Transitional Services, Inc, (FACETS). For the past 30 years, and with the help of numerous local faith communities, FACETS has helped some of the most vulnerable in Fairfax County meet their emergency shelter, food and medical needs. By opening doors and helping people gain safe, sustainable and permanent housing, FACETS aims to break the cycle of poverty through educational, life skills and career counseling programs. Fay notes that their multi-disciplinary professional staff manages a comprehensive range of programs, and a volunteer base of several thousand people. As a founding member of the Fairfax-Falls Church Community Partnership to Prevent and End Homelessness, FACETS is committed to working collaboratively in a countywide effort to expand safe and affordable housing. The Fairfax County Office to Prevent and End Homelessness, run by Dean Klein, is a public-private partnership that leverages the good work being done by local non-profits and aims to have these groups effectively work together to tackle a variety of issues that surround poverty and homelessness. Klein meets monthly with the groups that are affiliated with this network to help coordinate efforts, and the county provides funds to these groups to manage the work being done. In addition to county funds, each of these nonprofits conducts fundraising to support their own work. For every dollar that the county provides, these private groups at least match the funds, which makes this a very effective way to manage the support services needed by so many in our county of over 1.2 million people. Currently, it is estimated that approximately 6% of county residents live below the poverty level, leaving over 300,000 vulnerable county residents. 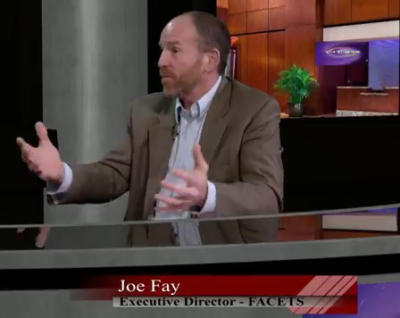 FACETS runs a wide variety of programming to meet the needs of county residents. Fay spoke passionately about their hot meals program that delivers meals 7 days a week, and two times on Sunday, to three different spots along the Rt. 50 corridor in Fairfax. Volunteers through faith-based partnerships fuel this program, like many under their purview. Fay also talked about their hypothermia programs that they run during the cold winter months. These programs are often operated by a house of worship, whose community agrees to open their doors for the night to provide warmth and food to those on the street. Often times, FACETS will use the vans that are delivering hot meals during the day to pickup people who use the day centers for the homeless and transport them to the hypothermia shelters in the evening. All of this work takes great coordination and many hands to keep the operations running. In addition to feeding the hungry and providing emergency shelter programs, FACETS works in low-income communities to provide support to families, through after school programming, adult education and career counseling services. These services are aimed to help engage families, provide much needed support so children in these families have a fair shot at success, and offer families the opportunities to become self sufficient. A key component to the success of FACETS is the extensive volunteer network they have built over the past 30 years. Even though the network is strong and effective, Fay notes that they are always looking to establish new relationships with individuals and organizations. If you are part of a service group or faith organization looking to take on a new project, FACETS is constantly welcoming new members to their network. You can reach them directly to let them know how you can help. (Apr. 2, 2018) Catherine Read interviews Joe Meyer, Executive Director and CEO of Shelter House, serving homeless families and victims of domestic violence in Fairfax County. Shelter House aims to break the cycle of homelessness by providing crisis intervention services, temporary housing and social services to promote self-sufficiency for their clients. He oversees the operations of two family shelters, the Katherine K. Hanley Family Shelter in Fairfax and the Patrick Henry Family Shelter in Falls Church. Additionally, Meyer oversees the Artemis House, a home specifically operated for women fleeing domestic violence. Shelter House received the 2017 Nonprofit of the Year award from the Northern Virginia Chamber of Commerce. Approximately 60% of the people who come to Shelter House are the working poor. They are often working low wage jobs on a full time basis, but are still not able to make ends meet. In Fairfax County, approximately 1000 people are homeless on any given night, and over half of those people are children. A decade ago Fairfax adopted a 10-year plan to eliminate homelessness. Through successful programs like Shelter House, Fairfax has cut homelessness by 50%, but Meyer notes that there is still quite a bit of work to be done. Dean Klein is currently the head of the Office to Prevent and End Homelessness in Fairfax County. He has built partnerships with over 20 organizations that work together to provide support and services to the most vulnerable in the community. Meyer shares that Shelter House follows the philosophy of “housing first”. The aim is to break down the housing barrier for clients, and help them get into a stabilized environment. The average shelter stay for a family is 65 days. Once the family is settled into a permanent housing, then social workers begin to help the family become self sufficient. In an expensive area like Northern Virginia, one might imagine that it is difficult to find an affordable place to live on a small budget. Shelter House has specialists on site who work with a network of landlords who have agreed to take in families at discounted rates, as long as they are receiving support and backing from Shelter House. These partnerships with landlords, business owners and community leaders are critical to making programs like this thrive. In addition to landlord arrangements, Shelter House works with employers who are willing to hire and train workers. These wrap around services that are being provided give families the opportunities they desperately need to break the cycle of homelessness and be able to thrive independently. In addition to giving the families the dignity of having their own home, providing services in this manner is far less expensive then keeping families in institutional homeless shelters. In the final segment of the show, Catherine speaks with Joe about the Artemis House shelter, specifically geared toward women who are fleeing domestic violence. 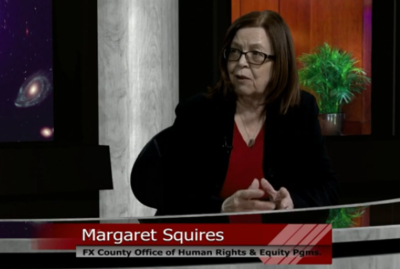 Fairfax County has a hotline for women who are in a dangerous situation, or Meyer shares that women can always call 911 if they are worried or fearful for their lives. He reminds us that a woman is most likely to be killed if she is in a domestic abuse situation and gets caught leaving. Counselors will give women tips to help safeguard themselves and their children. The shelter is at an undisclosed location for safety purposes, and employs trauma counselors for both the women and the children seeking refuge. 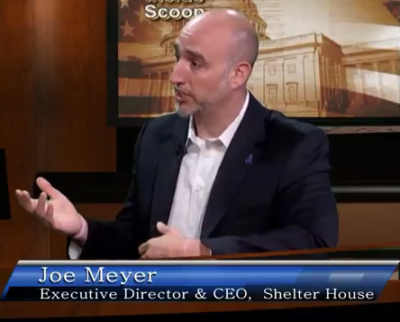 Finally, Meyer shares that Shelter House is holding its 5th annual benefit breakfast on Thursday April 12th at Westwood Country Club in Vienna. The event is sold out, but Meyer encourages anyone who would like to attend to visit their website and get on a waiting list. Additionally, if you are a landlord or an employer that would like to get hooked up with Shelter House, he encourages you reach out and make a connection. They are always seeking out business and community leaders to partner with. Shelter House also welcomes various groups like scouts, schools and community youth groups who would like to run collection drives or come in to run programs with the children at the shelter. Food, diaper, and feminine product drives are all welcome, along with hosting a monthly birthday party for children at the shelters. BRAWS and The Pajama Program are one of many partnering organizations. Any donation of time or money is greatly appreciated. If you, or a group you are affiliated with would like to get involved please reach out and you will be connected with the appropriate staff.